Mitsubishi announced that their team developed an ultra-compact Full Silicon Carbide (SiC) inverter, targeting HEV (Hybrid & Electric Vehicle) applications. They claim it to be the world smallest with a volume of 5 litres. The power density is 86 kVA/L, which is 10x more than CE+T Power, winner of the Google Little Box Challenge, with exactly 8.85 kW/L. Mitsubishi did not release more technical details than the picture up here. On the other side, they claimed to use solder to connect power semiconductors and cooling elements, in order to reach the best performance and lifetime. Commercialization is not planned before 2021… But more technical details will come during the National Convention of the Institute of Electrical Engineers (IEEJ) from March 15-17, 2017. Panasonic Corporation today announced that it will start mass production of a high-speed gate driver (AN34092B) optimized for driving its GaN power transistor X-GaN in November 2016. The company will also start mass production of two types of X-GaN (PGA26E07BA and PGA26E19BA) and provide solutions in combination with high-speed gate drivers. GaN is one of the next generation semiconductor compounds that can achieve space and energy savings when applied to transistors used in various power units. A gate driver is required to drive a transistor; however, general gate drivers for conventional silicon (Si) transistors cannot exploit the potential of GaN transistors since the gate structure of GaN transistors is different from that of Si transistors. The new high-speed gate driver (AN34092B) helps our X-GaN easily and safely achieves high-speed switching performance. It can drive transistors at high frequencies of up to 4 MHz and integrates the active miller clamp function that prevents malfunction during high-speed switching. X-GaN achieves a 600 V breakdown enhancement mode through our unique technology and features high-speed switching and low on-resistance. The combination of X-GaN and dedicated high-speed gate drivers will contribute to significant space and energy savings of various power conversion units for industrial and consumer use. 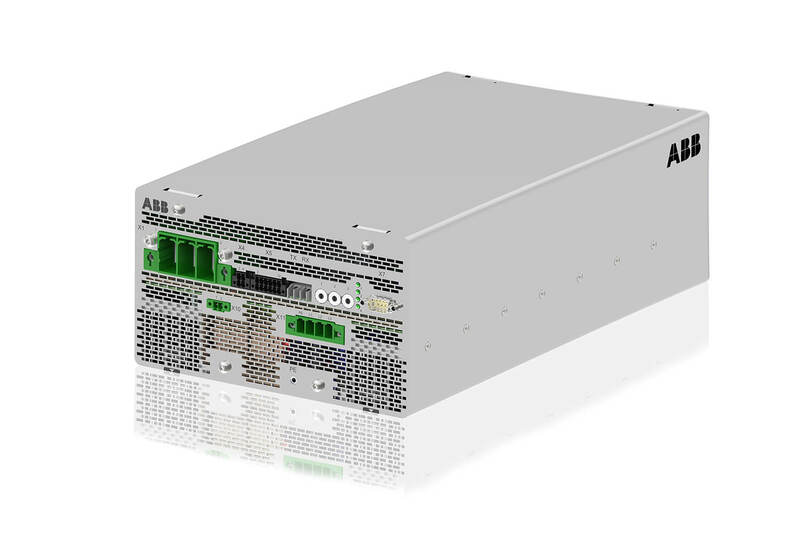 X-GaN and dedicated high-speed gate drivers are suitable for various applications such as 100 W to 5 kW power supply units, inverters, data centers, mobile base stations, consumer electronics, audio-visual equipment, industrial and medical devices. 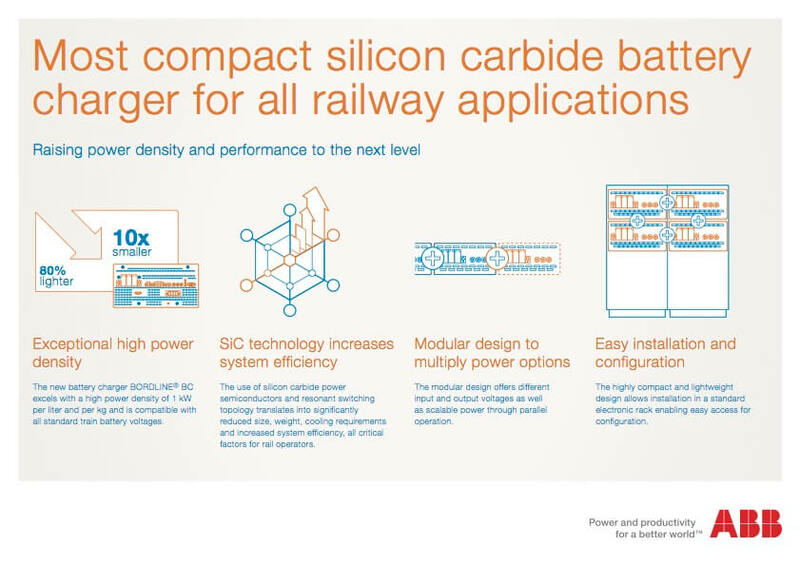 ABB is launching a next generation battery charger based on silicon carbide (SiC) power semicon­ductors for use in all rail applications. Train batteries provide power for critical systems such as control and lighting. The new compact battery charger of the series, BORD­LINE® BC, complements ABB`s large stand-alone auxiliary converter product family and is compatible with all standard train battery voltages. With a footprint of 360 x 220 mm – the size of a shoebox – it is about 10 times smaller and has a weight reduction of 80 percent compared to previous generations. The new device excels with a high power density of 1 kW per liter and per kg, an improvement from previous generations by a factor of 15. The BORDLINE BC battery charger employs ABB’s well proven modular platform design while incorporating SiC technology for the first time. SiC power semiconductor technology enables a power density and performance not possible with conventional silicon (Si) power semiconductors due to its conductivity characteristics. ­Mastering­­­ SiC technology translates into dramatically reduced size, weight, and cooling requirements, and increased system efficiency, all critical factors for rail operators. TDK Corporation and Toshiba Corporation have agreed to establish a joint venture , TDK Automotive Technologies Corporation, that will engage in the development, manufacture and sales of automotive inverters for hybrid vehicles, plug-in hybrid vehicles and electric vehicles. Many countries propose to impose more stringent regulation of automobile exhaust emissions in 2020 and after, in an effort to prevent air pollution and global warming. This trend to stricter regulation is expected to greatly affect the global automobile market, contributing to an increase in demand for hybrid and plug-in hybrid vehicles in the global market and greatly increased use of electric, fuel-cell, and other eco-friendly vehicles. Under such market conditions, TDK is currently strengthening its energy unit business, which mainly consists of hardware in power conversion for hybrid, plug-in hybrid, and electric vehicles, as well as software that controls such hardware as strategic growth products in the medium to long term. TDK offers a lineup of products, such as DC-DC converters, on board chargers and wireless power transfer systems that are currently being developed. The DC-DC converter in particular utilizes the magnetic material technologies that are the strength of TDK. They are one of the smallest in the industry and offer high efficiency and other product advantages that have won global recognition and a delivery record of more than 2.5 million units in aggregate. Upon the establishment of the JV with Toshiba as described above, TDK’s energy unit business is expected to expand tremendously, as the addition of automotive inverters to TDK’s product lineup will broaden its product range and enable to meet diverse customer demand. Toshiba develops technologies to meet automobile manufacturers’ requirements for low fuel consumption that combine advanced capabilities in automotive inverters with 120 years of cumulative know-how in motors. By integrating power semiconductor modules, Toshiba’s inverters secure high levels of heat dissipation in a short time, and also contribute to downsizing that reduces space requirements. Toshiba aims to strengthen its competitiveness in the growing market for automotive inverters and motors by combining its highly efficient automotive motors with automotive inverters developed by the JV and DC-DC converters developed by TDK, and proposing them as a system for hybrid and electric vehicles. Murata Manufacturing Co Ltd announced June 22, 2016, that it has developed a compact PV inverter with an output of 1kW. “Micro-inverter,” which is used for each solar panel, is being proposed in the US as an advanced version of compact/decentralized PV inverters, which recently started to be introduced. 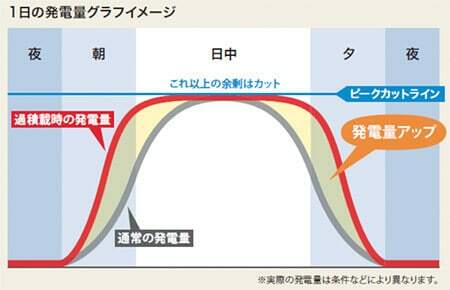 However, micro-inverters have problems such as a high cost, low conversion efficiency and insufficient compatibility with regulations related to grid connection, according to Murata. 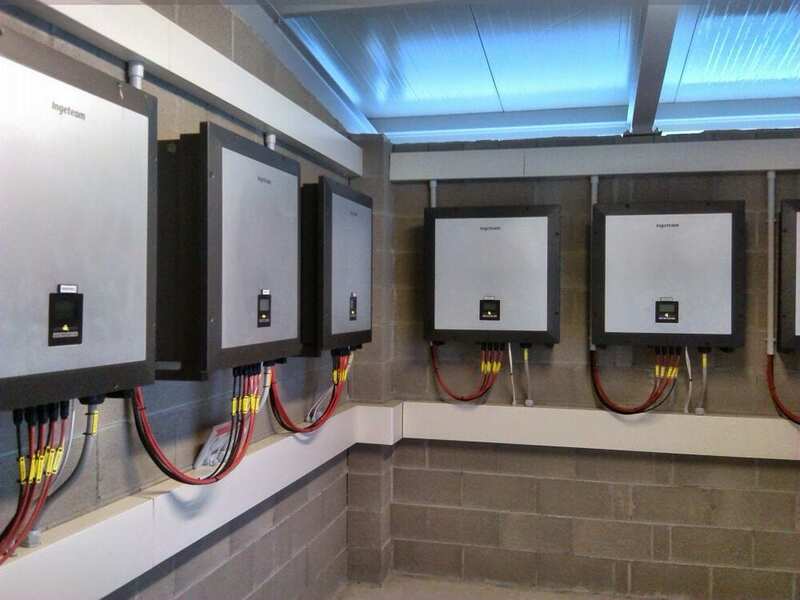 In view of this, Murata developed the 1kW product, “Mini-inverter,” as a PV inverter that features the advantages of both mainstream large-capacity/centralized PV inverters and compact PV inverters used for each panel. The new product controls several panels. Murata designed high-efficiency circuits so that they can be stored in a compact, thin, light-weight case. 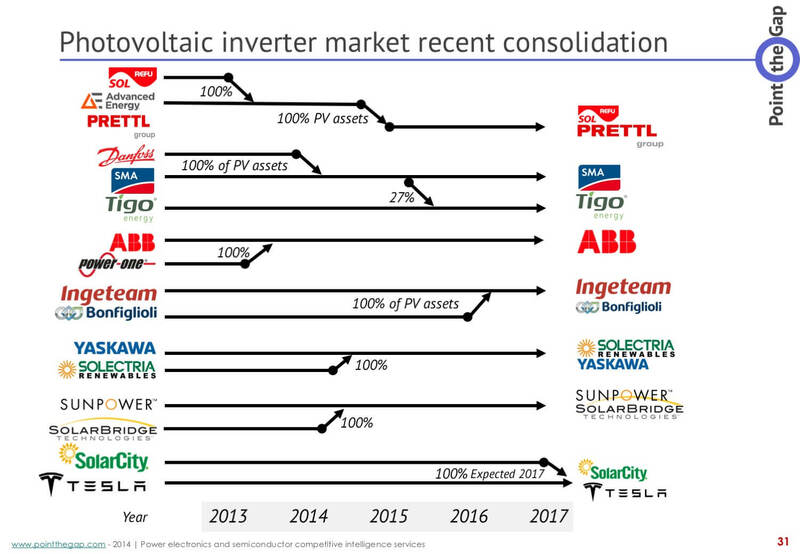 As a result, the company realized a high conversion efficiency of 97% and a compatibility for grid connection, like conventional centralized PV inverters, with the compact PV inverter. 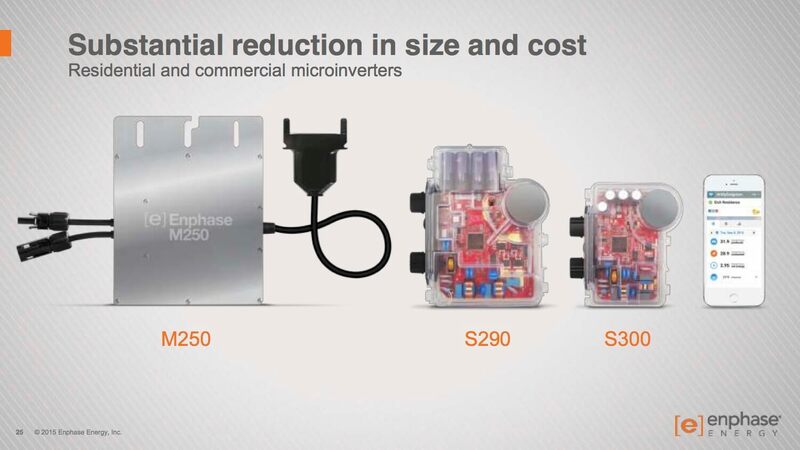 The service life of the Mini-inverter is 20 years, and it can drastically cut maintenance cost, Murata said. Data on the amount of power generated, etc is wirelessly transmitted (frequency: 920MHz). As a result, it becomes possible to eliminate the need for communication cables and to make the PV inverter work in conjunction with an HEMS (home energy management system) and BEMS (building energy management system). The input and output voltages of the new PV inverter are 80-250V and 200V, respectively. And its dimensions are 450 x 160 x 50mm. Murata plans to start volume production of the product in fiscal 2017. Silicon-carbide (SiC) power electronics from STMicroelectronics has been used in ZapCharger Portable, a small electric-car charging station from Zaptec, a start-up company in the transformer industry. ZapCharger works with any electric car on any grid. ST’s SiC MOSFET devices have enabled Zaptec engineers to design a portable, yet powerful piece of equipment. The 3kg, 45 x 10 x 10cm charger delivers an energy efficiency of 97%. Inside the ZapCharger, 32 Silicon Carbide MOSFETs from ST deliver efficient power conversion with minimum losses. “The key for us was to find a power technology with a very high efficiency so we could reduce the overall size of the charger without compromising performance. ST’s silicon-carbide offering was the perfect match,” said Jonas Helmikstøl, COO, Zaptec. The joint venture would capitalize on Valeo’s and Siemens’ leading positions in their respective sectors, with the ultimate goal of creating a global leader in the fast-growing market of automotive electrification. The two industry leaders would join forces to offer the most complete and innovative range of high voltage (above 60V) components and systems for all types of electric vehicles (hybrids, plug-in hybrids and full electric vehicles): e-motors, onboard chargers, inverters, DC/DC converters. Valeo would contribute to the joint venture its high voltage power electronics business (onboard chargers, inverters, DC/DC converters) employing around 200 people of which 90 are based in France. Its under-60V powertrain activity would not be part of this joint venture. Siemens would contribute to the joint venture its E-Car Powertrain Systems Business Unit (e-motors, inverters) employing around 500 people of which 370 are based in Germany and 130 in China. The joint venture would be headquartered in Erlangen, Germany. The newly created entity would leverage on Valeo’s and Siemens’ strong complementarity in terms of product portfolio and geographical spread generating synergies in manufacturing and sourcing. Its strengths in production and development would allow to target customers on a global level as well as in specific key markets. “We are delighted at the perspective of combining our strengths with Siemens in electrified powertrain systems,” said Jacques Aschenbroich, Chairman and Chief Executive Officer of Valeo. The project is subject to consultation of the employee representatives and approval by the relevant authorities. 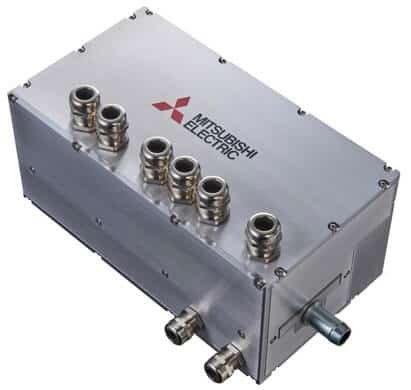 Mitsubishi Electric Corporation announced today that it has developed a next-generation power module called X-Series New Dual HVIGBT module for traction and electric power applications in heavy industries. The new module features higher power density and efficiency for inverters, as well as a standardized package that allows for a flexible design of inverter systems. The seventh-generation IGBTs adopting CSTBTTM and RFC diodes realize low power loss in inverter systems. Improved package technology and low parasitic inductance enable maximum performance. Three AC main terminals on the LV100 package spread and equalize current density, contributing to increased inverter capability. LV100 and HV100 modules have a common package design. Simple, standard connections allow for optimal system design and a range of current ratings. Lineup ranges from 1.7 to 6.5kV. Improved flexibility and scalability for system configuration. Compatible with terminal and attachment locations of Infineon Technologies AG (Germany) products. Navitas Semiconductor today announced the world’s first Gallium Nitride (GaN) Power ICs, using its proprietary AllGaN™ monolithically-integrated 650V platform. Combining GaN power FETs with GaN logic and drive circuits enables 10x-100x higher switching frequency than existing silicon circuits, making power electronics smaller, lighter and lower cost. A new generation of high frequency, energy efficient converters is being enabled for smartphone and laptop chargers, OLED TVs, LED lighting, solar inverters, wireless charging devices and datacenters. says Dan Kinzer, Navitas CTO & COO. 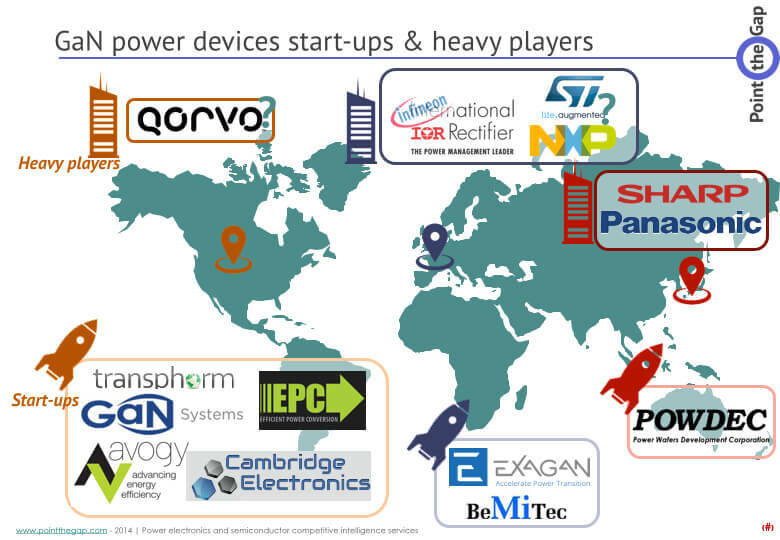 Navitas Semiconductor Inc. is the world’s first and only GaN Power IC company, founded in El Segundo, CA, USA in 2013. Navitas has a strong and growing team of power semiconductor industry experts with a combined 200 years of experience in materials, circuits, applications, systems and marketing, plus a proven record of innovation with over 125 patents among its founders. The proprietary AllGaN™ process design kit monolithically-integrates the highest performance 650V GaN FET and GaN driver capabilities. Navitas GaN Power ICs enable smaller, higher energy efficient and lower cost power for mobile, consumer, enterprise and new energy markets. Over 25 Navitas proprietary patents are granted or pending.